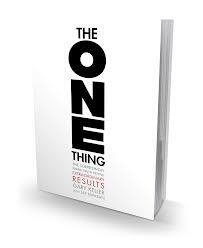 what is the “one thing” you need to be doing? Good Monday morning to you! Hope you had a great Independence Day. We certainly did – it was a nice 4-day weekend with all of our family here at the house, so a nice and relaxing time. Although we did eat a tad too much!! Do you wonder why it is that you seem so busy, but when you look back on your day or week, you don’t feel that you have been productive? Could it be that you are working on tasks vs. priorities? I have posted on this before, but it has been brought back to me anew in a book I am reading right now entitled The One Thing by Gary Keller. What is the ONE THING I can do such that by doing it everything else will be easier or unnecessary? That’s what he calls the “Big Picture” question which he then follows up with “What’s my one thing right now?”, which is what he calls “Small Focus”. Asking these two questions brings you back to priorities and should cause you to work to priorities. When you ask yourself those two questions daily, you begin to work day-to-day on your priorities and the result is incredible effectiveness. Of course it seems simple – and it is relatively so. But it is HARD. You have to break old habits and develop new ones. You have to go against work cultures that say they want productivity, but seem to reward busyness. Simple yes, easy no. But it is worth it! You have but this one life – are you living it to priorities, or are you content to just be busy every day? It is YOUR choice.